Released in 1982, Disney's Sci-Fi film Tron took movie goers into a new realm of move special effects. The movie Tron takes place inside a large computer network that has fallen under the tyrannical control of the MCP(Master Control Program). Tron, Flynn, and Yuri are the heroes in this film who try and free the system from the MCP's control. Aside from being a smash hit in the theater, Tron was also a major success in the new video game arcades of the early eighties and on the home console video game systems of the day. Children were not only in awe by the movie but also with the video games. So much so that a toy line based on the movie and video games would probably have success. The Japanese toy company TOMY acquired the toy license from Disney in 1981. At the time TOMY was into marketing wind-up toys, little ones at first and then big ones later in the form of ZOIDS, but that is another story. Tron would prove to be TOMY's first action figure line. Released only in United States, the Tron toy line has a small start and ended quickly. In 1982, TOMY released their Tron toy line, surprisingly it didn't consist of a wind-up toy. Four figures and two light cycles made up the entire line. The four figures were: Tron, Flynn, Warrior, and Sark. All the figures were made with transparent plastic and came with glow-in-the-dark weapons. The detail on the figures was not great, but each figure had white line designs on them giving them the fell of the characters from the movie. Tron, Flynn, and Sark all came with data disks while the Warrior came with staff. 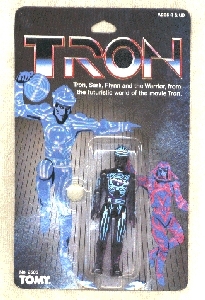 The action figure of Tron was colored purple while Flynn was blue. I guess this was so kids cold tell the two figures apart because the only difference in the actual mold of the figures was the chest. Both Sark and the Warrior were made in red. The packaging for each figure was the same, grey on the front with Tron artwork and on the back pictures of the entire line. The only minor difference between each figure's blister was the small line of black print just under the bubble on the card that stated the figure's name. The two vehicles that were produced were light cycles. Each came with rip-cords which was needed, because you can't push a two wheeled toy across a floor without having it fall down a second later. The rip cord gave enough momentum to the back wheel of the cycle to give it enough balance to stay upright as it flew across a flat surface. The light cycles came in two different colors: Red and Yellow. Prototypes of this toy line have surfaced over the years. The prototype figures that were pictured on the back of the blister and on the light cycle boxes were never released. But in 1996 there was an auction where all the prototypes were sold. All of them had glued limbs. A prototype package mock-up with a test-shot Sark figure (which differs slightly than the production pieces) can be seen here. Other unknown prototypes were made and still have yet to be found. The person who supplied the auction with the prototype Tron figures also had a prototype Tank toy (which did not go up for auction). The toy was about 12" in length and and spaces for the figures to go into. Although only two lightcycles were produced by Tomy, a Canadian toy company called Toy City produced Blue, Neon-Green, Silver, and Orange light cycles. The light cycles almost identical to the TOMY light cycles, in that the molds are the same and they also used Rip-Cords. The only difference is that the Toy City cycles are 3/4 the size of the TOMY light cycle. A TOMY Tron figure will not fit inside of a Toy City light cycle, but the Toy City cycles do have the rip-cord mechanism and move. These smaller cycles came on blisters packaged with a rip-cord. It is still questioned if they are knock-offs, or Toy City bought the molds, but not the rights to use the Tron name. Many other Tron toys were made during the '80s. A large Tron bendie-doll was released in the U.K.. TOMY produced a lap-top LED video game. A yo-yo that lit up, and even a inflatable frisbee was also produced. Compared to other toy lines, Tron's was slim and small. There were not many Tron collectibles during the 1980's. Today Tron collectibles are hot. Boxed light cycle's are the hardest Tron toys to find. Tron toys are very popular in Japan, because they were never released there. The Japanese desire for Tron toys has strengthened the market for them. In 1996 Disney re-released the movie Tron as a special edition Laserdisc box set with extra footage and interviews. In a way this re-released as resparked new interested in Tron. Tron was one of Disney's first releases on DVD. As of today there are several rumors of a Tron sequel in the works. Tron will gain strength in popularity, and as a collectible toy-line. Make sure to visit The Toy Archive for more information on rare and unique toys from the 70's, 80's, and 90's .